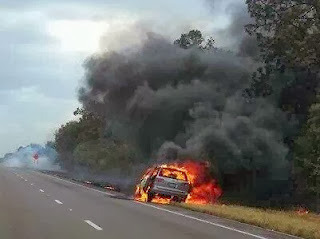 PALM BAY, Florida -- A brush fire that had been contained Wednesday evening flared up again at 9:30 p.m. Wednesday night near Osage Street in Palm Bay, Florida. Multiple fire rescue trucks were deployed to head off the fire at Elfin Street, which is north of Valkaria Street and east of Babcock Street SE. Just after 10 p.m., three more engines were dispatched to Elfin Street to try to prevent the fire from reaching Babcock Street. 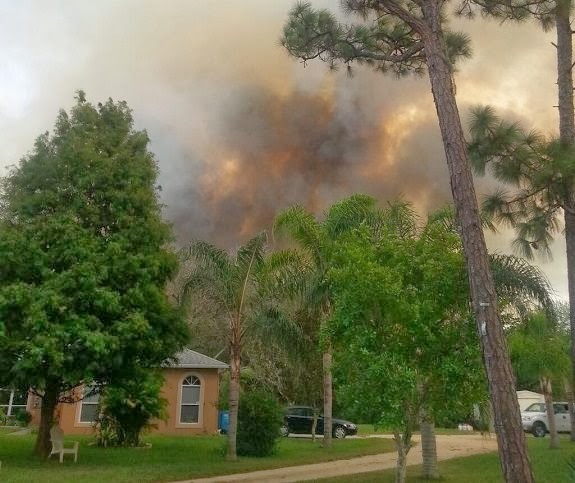 As of Thursday morning, the fire remains in the original containment area and Florida Forestry Service is mopping up the smoldering area, Brevard County Fire Rescue reported. The brush fire was sparked by a van fire on Interstate 95 at mile marker 171 about 1:45 p.m. that fire crews are continuing to fight this evening. Five agencies -- Brevard County Fire Rescue, Palm Bay Fire Rescue, Melbourne Fire Department, Indian River County Fire Rescue and Malabar Fire Department -- worked together, with Palm Bay Fire Rescue in command. Once the 50-acre fire was 75 percent contained, command started releasing mutual aid units at about 5 p.m.
Country Beginnings Daycare on Babcock Street was evacuated as the fire moved through a wooded area east of Babcock and north of Elfin towards homes. Tractors cut lines in the woods to stop the fire's spread. By 8 p.m., the fire was 100% contained. Windy conditions today and tonight helped fan the blaze. According to the National Weather Service, the unofficial peak wind gust in Melbourne reached 39 mph at 9 p.m. As of 10 p.m., sustained winds from the northeast remain over 20 mph with gusts over 30 mph. Windy conditions are forecast to persist through Thursday. 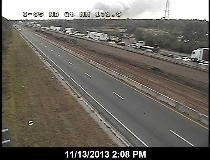 Smoke from the fire caused the Florida Highway Patrol to shutdown southbound I-95 near mile marker 170 this afternoon, causing traffic to backup for several miles. I-95 has since been re-opened, and remains open as of 11 p.m. tonight.